I began my culinary journey in my late teens as a means of bringing my family and friends closer together. I quickly fell in love with the thrill of cooking a dinner for 30 people in my tiny studio. I knew that I wanted to pursue food professionally. So I did the next best thing: I dropped my life in Brooklyn and moved to Paris. There, I studied pastry at Le Cordon Bleu and cuisine at École Grégoire-Ferrandi and traveled throughout Europe. After graduating, I went on to work alongside Michelin Star Chef David Toutain of David Toutain and Chef Daniel Baratier of Les Deserteurs -- two of the most talented French chefs. Now back in New York, I hope to bring my passion for food to your next event. I am always striving to create individualized dining experience that is both refined yet unexpected for my clients to enjoy with their guests. Constantly evolving and changing, my cuisine is inspired by my continuous travels as well as by my native Russian roots and traditional French training. My cuisine highlights the best of locally sourced, seasonal produce of New York, with great emphasis on proper techniques, bold flavors and finesse. The full-service experience includes preparing, serving, and offering detailed explanations for each dish, as well as cleaning and ensuring that your kitchen looks exactly as it did when we arrived. Your event can be as small as a romantic table of two to a fifty people bash. Servicing New York Tri-State Area, New Jersey and the Hamptons. The multi-course tasting menu focuses on creating a culinary journey with an emphasis on techniques, product, and presentation. The menu is designed to be surprising yet approachable by offering combinations of flavors both familiar and unexpected. 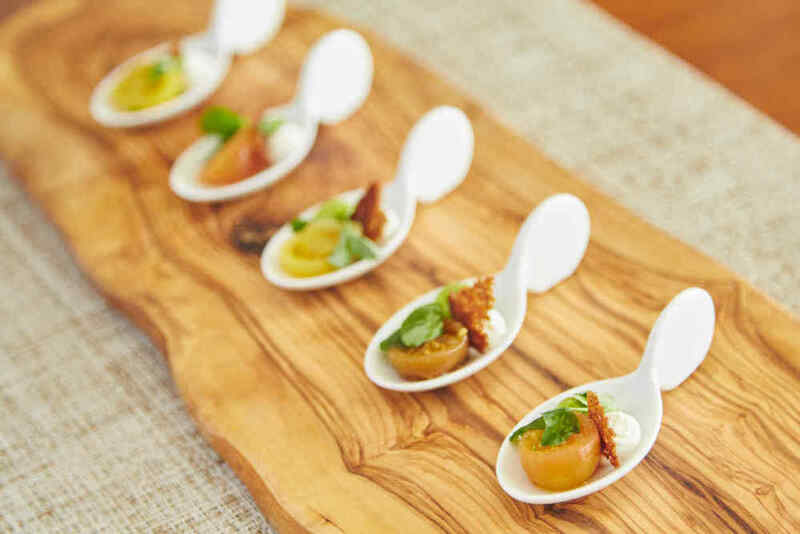 The cocktail canapés aim to bring you an assortment of exquisite savory and sweet hors d'oeuvres that complement any cocktail or wine party. Make business events more special and productive by having an intimate lunch or dinner at a location most convenient for your team as an alternative to traditional restaurant meetings. Every menu is unique and custom created for every event. Please enjoy the menus below from previous events for inspiration. Price of services fluctuates based on the market price of the produce that day. The final cost will only be determined once your menu has been finalized. For more pictures of my work, check out my Instagram. "I had Lena cook for my mother's 75th birthday dinner in New York and we were all very impressed. Lena showed up on time, worked in an unknown kitchen with practically no direction, cooked a delicious 5 course meal with flavors that surprised and delighted, as well as cleaned up completely as promised." "Amazing food I left everything to Lena and she listened carefully to what we wanted it was perfect special and I would do it all again tomorrow. Thank you!"